Rhythm is powerful. Tapping into your own inner tempo, while simultaneously syncing your movements with the people around you, creates a deep, freeing connection to your inner self. Find that feeling with this ladder-based flow, a continuously building series of poses. Expect lots of dynamic movement connected with the breath and the opportunity to drop into a powerful moving meditation. Some yoga experience encouraged. It takes strength to have an open heart, and a strong, open heart to grow. Move through poses that will help open the front body, while strengthening and preparing the back body and shoulders to work toward the complex mobility of Scorpion variation of Handstand. Wall and partner work included. Some yoga experience encouraged (but no need to have a perfect handstand in the middle of the room!). 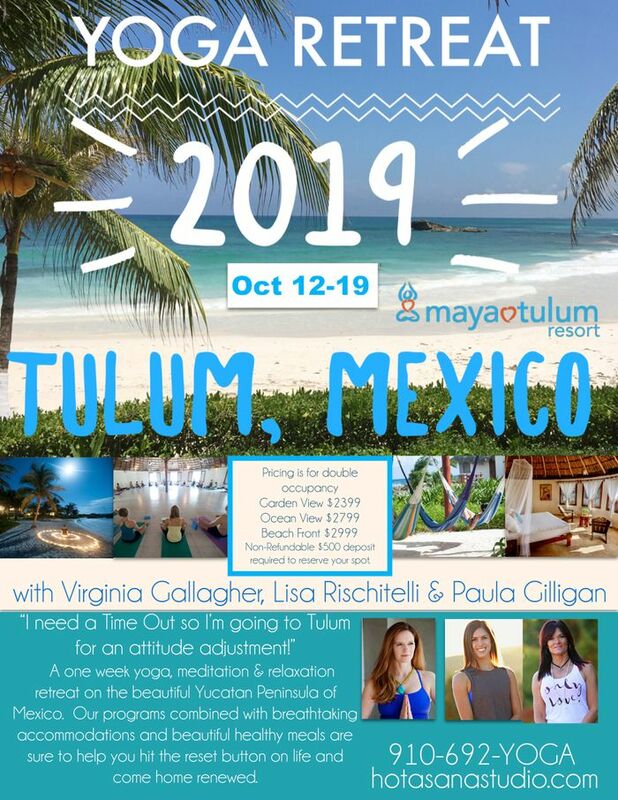 Teacher Forum: Yoga teachers, join Lisa after each session to receive a breakdown of the sequence, learn the why behind the class, and ask any questions. Since the inception of American Yogi last year, our community has grown thousands strong. We span across the nation and across the globe. We are Soldiers, veterans, paramedics, mechanics, teachers, mothers, and fathers. We are fighters. We are seekers of peace. And for the first time, we can practice together. Join us August 4th at the Sunrise Theater green space in downtown Southern Pines, NC for Om’erica: The Yoga Fest. A day of yoga that represents our roots—the military veteran. 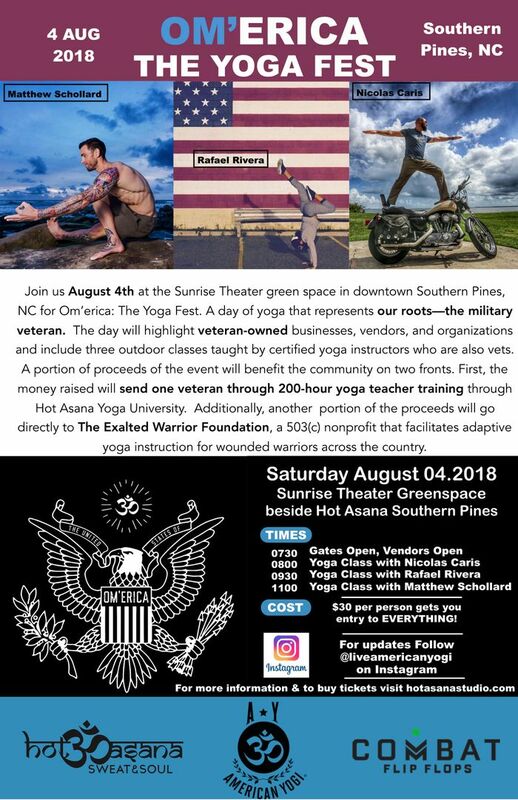 The day will highlight veteran-owned businesses, vendors, and organizations and include three outdoor classes taught by certified yoga instructors who are also vets. The proceeds of the event will benefit the community on two fronts. First, the money raised will send one veteran through 200-hour yoga teacher training through Hot Asana Yoga University. 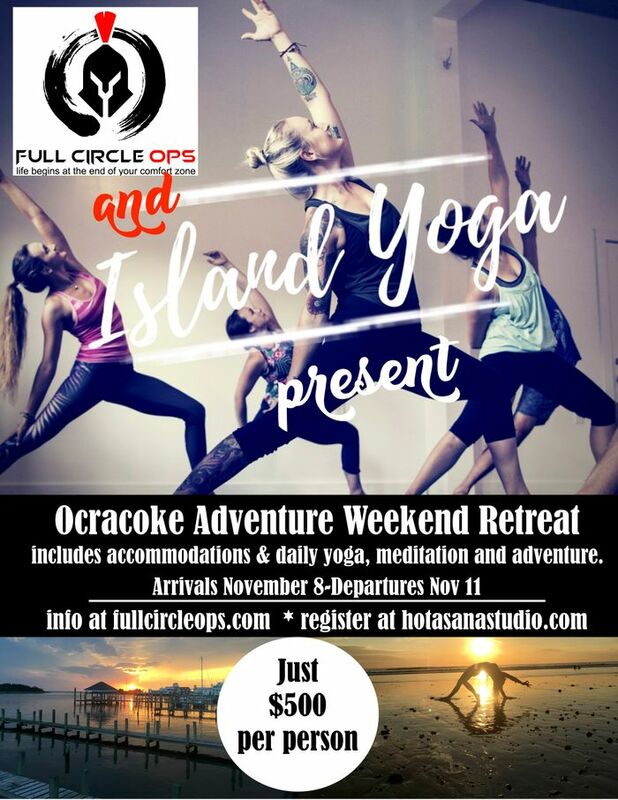 Additionally, a portion of the proceeds will go directly to The Exalted Warrior Foundation, a 503(c) nonprofit that facilitates adaptive yoga instruction for wounded warriors across the country. Price of entry gets you admission to three classes as well as access to vendors and raffles from Combat Flip Flops, Hot Asana, and more! Bring your mat, a towel, and favorite yoga buddies for a morning of peace and community. And as always, American Yogi merch will be available for purchase, including a limited-edition shirt designed especially for the event! Click the link on our profile for tickets. Admission will be available for purchase on site, but due to limited capacity of the outdoor space, we recommend you book early to ensure a spot!" Limited spaces available. Reserve Your Spot Here! 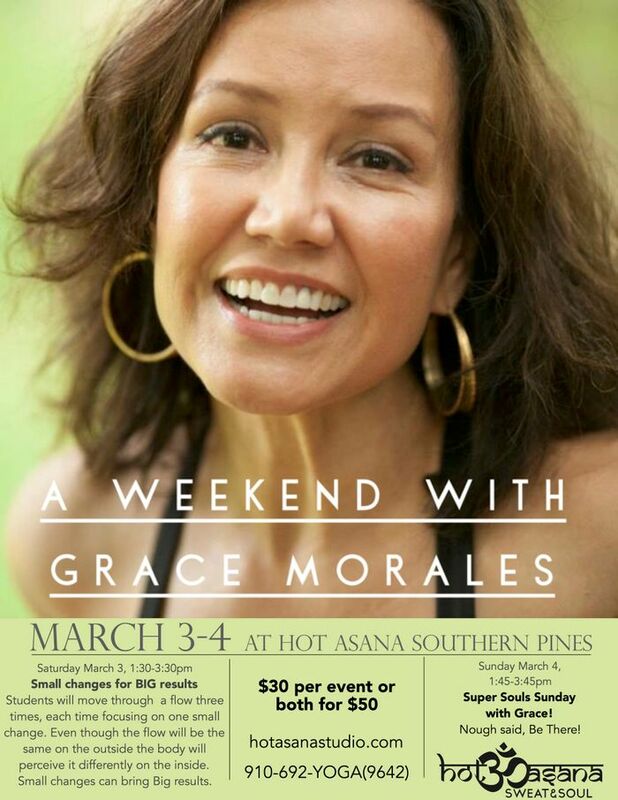 Sunday March 4th: Super Souls Sunday with Grace! Nough said, Be There! Join internationally recognized Bryan Kest for a special Power Yoga Master Class in Colorado Springs. Bryan Kest began practicing yoga in 1979 and studied directly with Pattabhi Jois in 1983 in India. As the creator of Power Yoga, Bryan has influenced Vinyasa yoga as we know it in the U.S. today. Bryan’s classes are well-rounded, flowing asana practice that integrates mental practices that enhance everyday living. The class is intended to invigorate your body and help you develop a calm, less reactive state of mind with dynamic flowing routines. 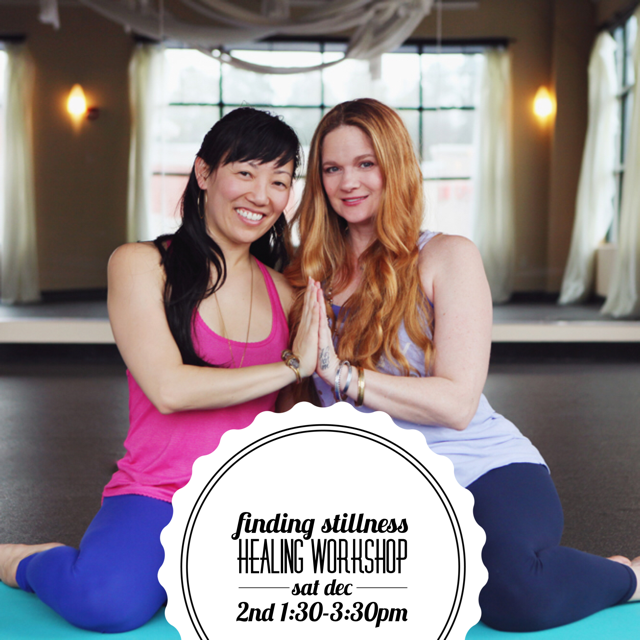 In this Power Yoga workshop, you’ll be encouraged to focus on the process and not the end result. ALL levels of yoga practitioners will enjoy and benefit from the workshop.